As I may have mentioned, we are theater people. My husband is an actor. My daughter also acts and sings. My son plays piano and violin. He loves to listen to music. He loves seeing his sister perform in shows, and occasionally, even enjoys ones she is NOT in. My children are lucky. They have been exposed to live theater since they were very little. A lot of our kids are fortunate that way. I grew up in a very nice neighborhood in Queens. My schools were a melting pot of kids. There were kids of every race, creed, religion, political affiliation, and socioeconomic status. Yet, we all received, once at school, most of the same opportunities. We were fortunate. But there are a lot of schools in New York City that do not have that same good fortune. The Theater Development Fund (also known as TDF) is trying to do something to change that. Through the program TDF Stage Doors, they are trying to make sure that all the schools on their list get to send their kids to see a Broadway or Off-Broadway show. Their motto is: “Transform Each Student, One Performance at a Time”. Stage Doors is TDF’s largest education program which currently serves 7,500 students from 78 New York City public schools from all the boroughs. But there are 60 schools on the wait list. Each school needs $5,000 to be able to participate in the program. Here are some facts about the children who are involved in the program. 75% are of Hispanic or African American descent. 70% of those children fall on or near the poverty line. More than 80% qualify for free for reduced cost lunch. The program is absolutely free of charge for those schools. In addition to going to see the show, the students also receive a guest artist visit to their school from either an actor in the show, a musician from the show or a member of the creative staff, be it a writer or designer. There they learn the creative process through script writing, acting, directing, songwriting, and movement. As I have also mentioned, I am a Hamilton fan. For my birthday, my dad gave me at the book of Hamilton, which consists of the entire libretto, along with passages and footnotes about how the show was created. There was one section entirely dedicated to the shows where inner-city schools came to a performance. Since the show is a mix of rap, hip-hop, R&B and your usual musical theater faire, the creators and performers were curious to see how it was received by these kids, in particular. The chapter, entitled, “An Account of Rapping for the Children Who will One Day Rap for Themselves”, the cast talks about how, only a few weeks after their opening, they would welcome their first school audience. 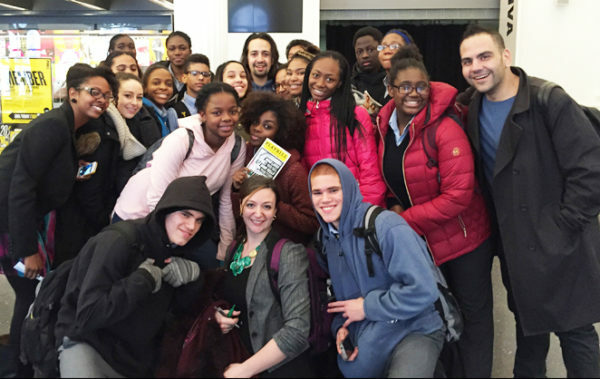 The opportunity came through The Public Theater’s partnership with TDF, as a matter of fact. Some of the students were from, of all schools, Fort Hamilton High School. The teachers prepped their students with lessons relating to Alexander Hamilton. Back in the classrooms, the students were more compelled to learn about their country’s history and understand it. Some were asked to write a rap about one issue in our society today, and use a line from the show, and then go head to head, as they do in the show, in a rap battle. How a show, a show as powerful and in demand as this, has managed to reach kids who would otherwise never have access to this experience, has the TDF Stage Doors program to thank. Seeing your first Broadway show is something that most of us never forget. Wouldn’t it be great to give that same experience to someone else? For the love of theater! *Images courtesy of The Theater Development Fund.